The International Alliance For Responsible Drinking (IARD) are a not-for-profit organization dedicated to addressing the global public health issue of harmful drinking. They are also committed to promoting responsible drinking worldwide, and acknowledge that this can only be achieved by a collective effort shared by governments, producers, retailers, consumers, and civil society. As a global public health NGO, they work together with these stakeholders to promote policy dialogue, assess the evidence, and seek local solutions to harmful drinking globally. IARD’s Issues Briefings address various topics relevant to alcohol policies, providing the balance of available evidence regarding impact, caveats, and limitations. The excerpt below is taken from ‘Determinants of Drinking’. Which are the most influential determinants? How can they best be addressed through interventions? Genetic predisposition plays an important role in shaping both drinking patterns and outcomes but is modified by interaction with social and economic variables. Various individual characteristics—including current age, the age at which drinking commences, personality traits, and physical and mental health status—affect the development of drinking patterns. Socioeconomic status, notably social marginalization and economic deprivation, influences the relationship between drinking and problems. Family is pivotal to forming alcohol expectancies and drinking behavior, as are peer interactions and influences, both of which have a role in social networks. Finally, the broader environment within which drinking develops, including general drinking culture, its norms and practices, religious beliefs, and the availability of alcohol and its saliency, is also significant in how drinking patterns develop and progress. The complexity of the interactions among different factors makes cause-and-effect relationships difficult to ascertain. Individual influences cannot be uncoupled from other factors that are strong in people’s lives and shape perceptions and behaviors. Much attention has been paid to the relative impact of various factors that influence drinking behavior, particularly among young people. 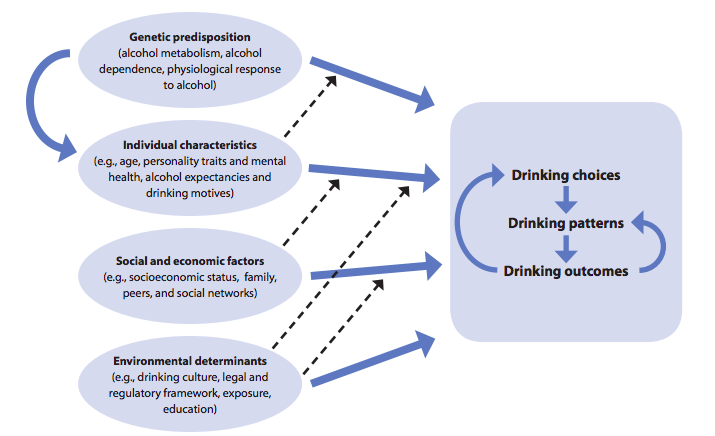 Determinants of drinking include biological, social, and economic factors, as well as the wider drinking environment. These factors have a significant impact on individual response to alcohol consumption and outcomes, and help shape consumer choices and behaviors. Research often focuses on these factors one by one; however, their influence is complex and interrelated, and effects cannot easily be disaggregated. Substantial interdisciplinary research is needed to better understand how different determinants interact. Similarly, there is a need for multi-component approaches to policy and prevention that simultaneously address these determinants. This debate also extends to identifying the most appropriate and effective approaches to prevention and interventions, whether through education and social interventions or restrictions on access and exposure to alcohol. Read the full briefing here!